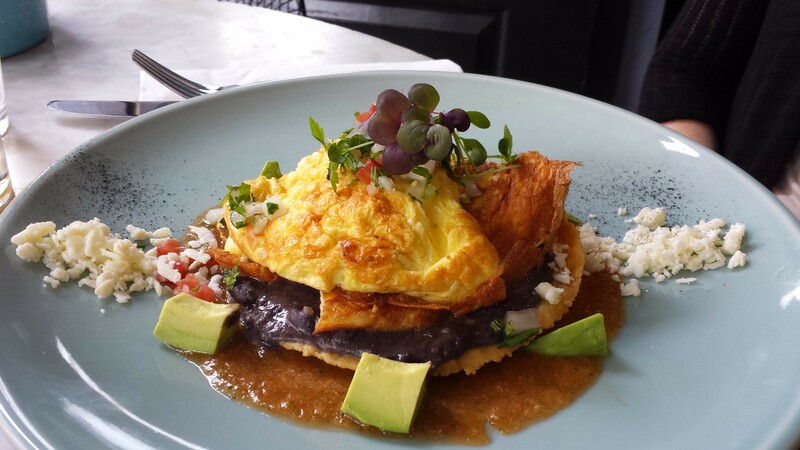 It’s no secret that we at I Heart Brunch have a soft spot in our hearts for Mexi-brunch, so we’re always excited about new restaurants that can satisfy that craving. 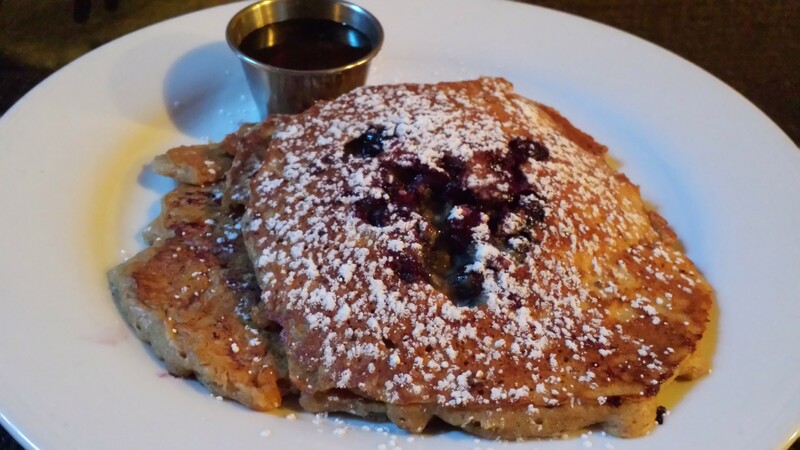 From the same folks behind Ofrenda in the West Village, The Black Ant has been open in the East Village for a few months now and just added brunch to their menu, so we were eager to try it out. We’re happy to report that The Black Ant lived up to its early Yelp hype and did not disappoint! Let’s start with the ambiance. It’s a really fun space—long and narrow and somehow modern and vintage and trendy all at the same time. There is a range of seating options from traditional to bench seating facing the bar (great for solo diners) to tall cocktail tables with barstools on the small street-side patio (great for people-watching). And the service was great as well. Everyone we met was so friendly and seemed truly passionate about the food. They were happy to make recommendations (and accommodations) with a smile, and got us excited about options we might not have necessarily considered without their explanations. And oh yeah…the food! 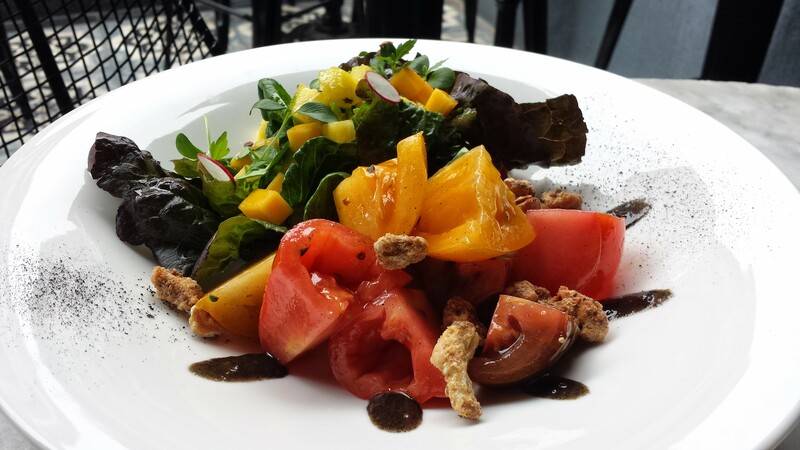 We started with the Ensalada Mixta, a pretty mixture of heirloom tomatoes and arugula and fruits to kick our meal off on a lighter note. We tried to stay “good” and skip the guacamole, but thankfully listened to our server and tried it—yum! For the entrees, the winner was hands down the Huevos Pochados con Langosta, Black Ant’s take on a lobster benedict. 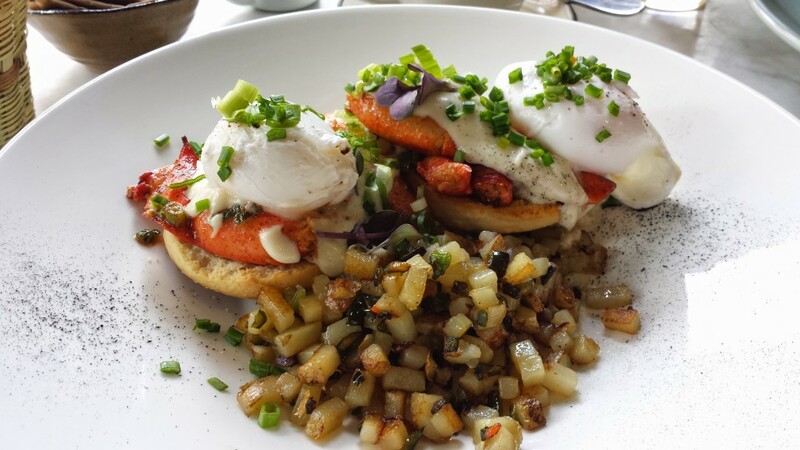 Perfectly poached eggs were carefully placed atop a generous portion of fresh lobster on warm jalapeno biscuits and covered in a chorizo gravy. 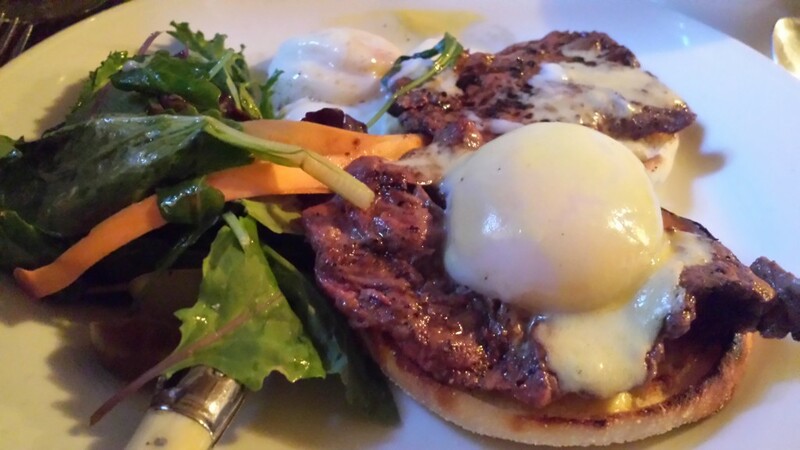 It was a rich and hearty dish that holds up to some of the best benedicts around and we’re still licking our lips thinking about it. The vegetarian in our party noticed that the menu lacked a savory veg option. It would be nice if they added a veggie option to the menu, but the server was more than happy to work with her to create a modified version of Los Rancheros de Teresa. This basically turned into a create-your-own scramble, accompanied by sides of black beans and hash browns, which were actually more like finely diced home fries. Probably not how the chef intended it, but we were satisfied and appreciated the accommodations. We nearly ordered the Pan de Dulce —a Mexican-style French toast with Manchego toast, salted caramel, berries pico de gallo, and verbena ice cream —for dessert but we were just too full. We’ll have to get it next time along with the Duck & Eggs or Grilled Octopus Bacon Roll that we sadly missed out on trying. Overall, The Black Ant is a welcome new Mexi-brunch in a city that doesn’t have enough. Try it before everyone else discovers it! 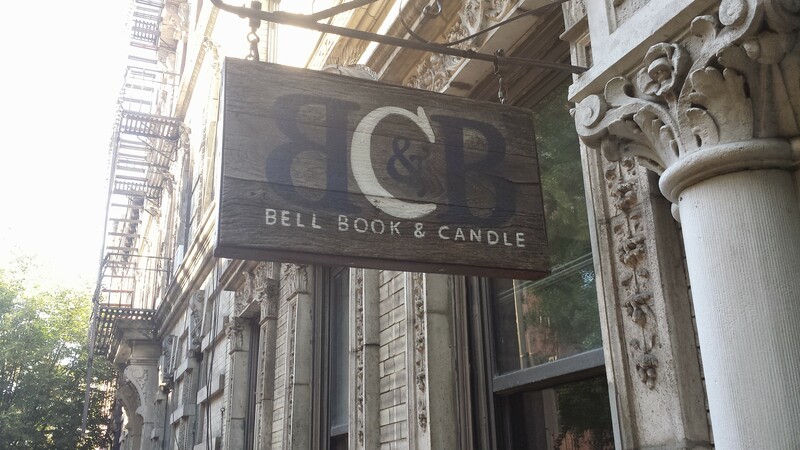 Looking for something off the beaten path (but not too far off of it)? Then you might want to check out The Creek & The Cave, which offers a tasty excuse for a mini day trip to Long Island City! The Creek & The Cave, a local bar and grill turned comedy club in the evenings, added brunch to its menu about a year ago. 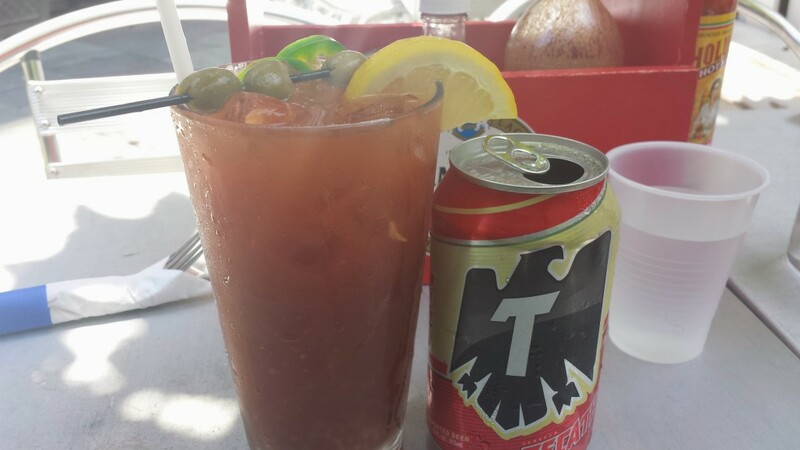 It offers a range of Cali-style Mexican food, which we’ll discuss, but the real draw is specialty drinks such as the two-in-one Murderfist , tequila and Tecate over Bloody Mary Mix, and $0.25 Mimosas (no that wasn’t a typo—25 cent Mimosas!!) weekends from 12-4pm. We didn’t expect much for that price, however these mimosas are served in a highball glass and had the perfect champagne-to-OJ ratio, so they really are a great value. 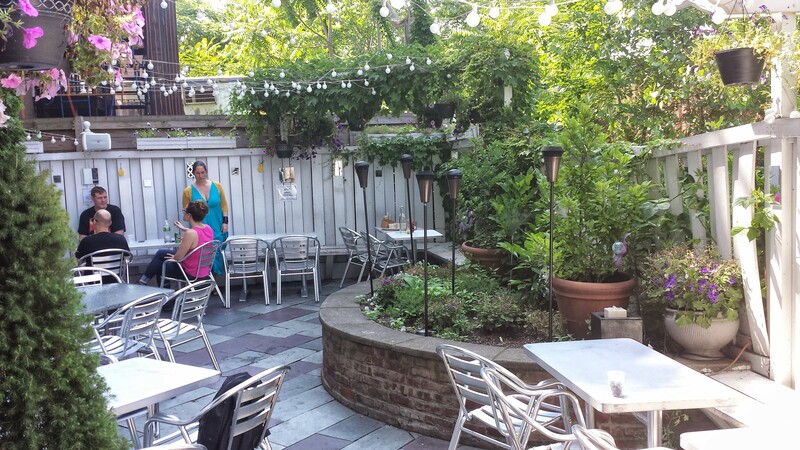 We went on a warm summer day and enjoyed a lazy afternoon out in the spacious back patio. We started with the Homemade Salsa Sampler, a bowl of homemade tortilla chips filled with a flavorful house salsa, fresh chunky pico de gallo, and cool guacamole. They were all delicious, but the smooth, tasty guacamole was the unanimous favorite. A few mimosas later, our entrees arrived. 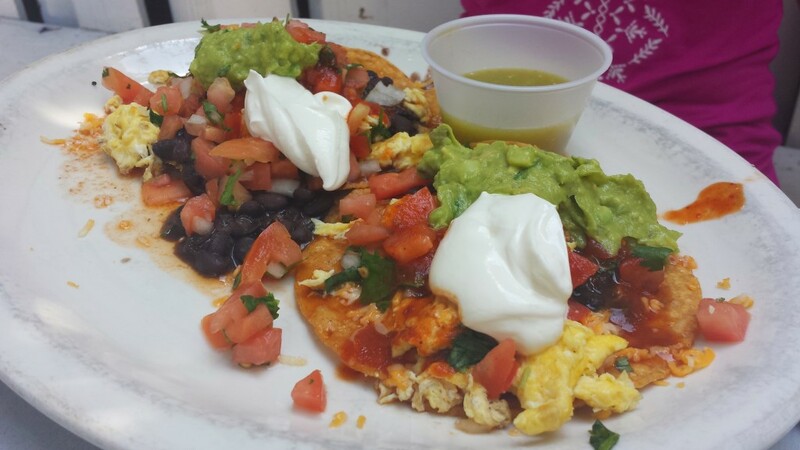 Our waitress had recommended the Huevos Rancheros and after the first bite we understood why—the mix of eggs, cheese, beans, guac, salsa, and sour cream on crunchy tortillas had an authentic taste that we still crave. But I may have actually liked the Chilaquiles even more though, and I’m typically not a huge fan. They were so perfectly soaked in the spicy salsa verde that they almost melted into the accompanying eggs and skirt steak. 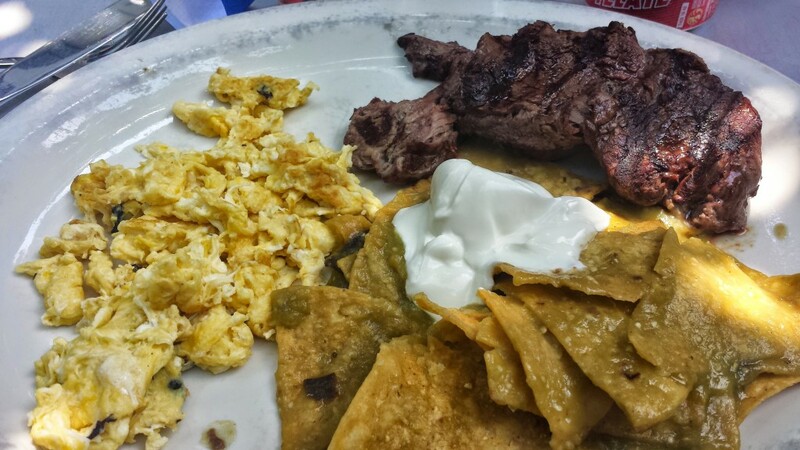 Chilaquiles Verde with Skirt Steak…YUM! If you’re not in the mood for breakfast, you’re in luck—The Creek & The Cave offers a wide range of traditional lunch/dinner entrees. We tried the Yoga Burrito, and felt healthier with every bite. 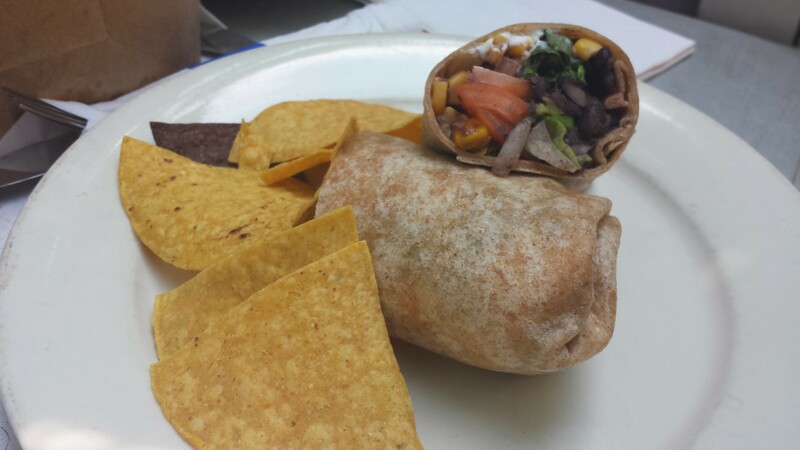 The whole wheat tortilla and range of veggies might sound like something you could get anywhere until you add in the goat cheese for an overall different burrito experience. 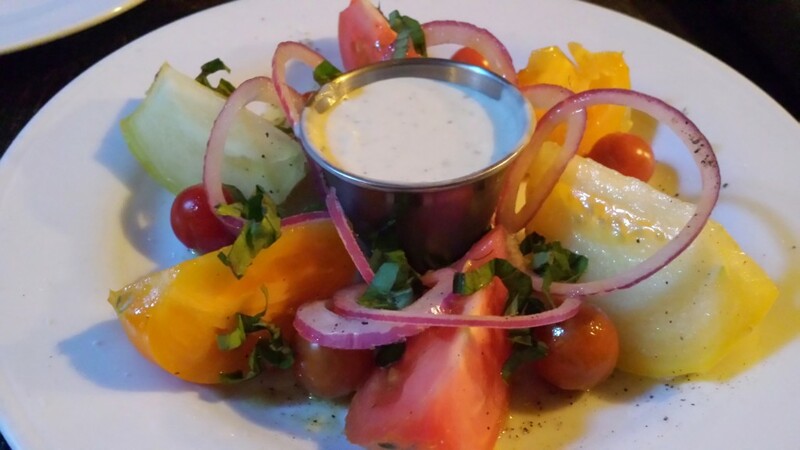 This was just one of the many vegetarian-friendly options—there is even a vegan enchilada. 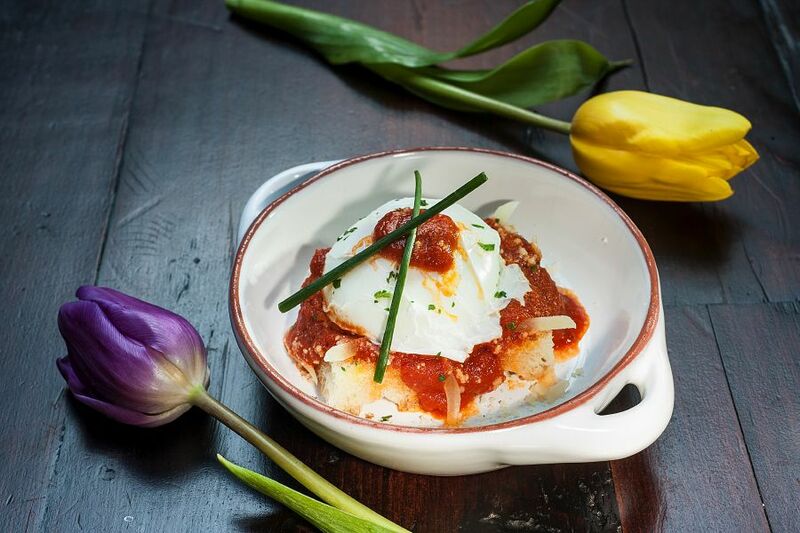 All of the food was great and entrees hover around ten bucks, but the best reason to try The Creek & The Cave is because it’s one of the best boozy brunch deals we’ve discovered. Oh, and if you want some entertainment in between those $0.25 Mimosas, The Creek & The Cave has eight pinball machines and comedy shows all night long. Nearly a year after writing about the burgeoning Grand Street in East Williamsburg, a new restaurant, Williamsburg Kitchen, recently opened with a vision of bringing a little modern flair to the neighborhood’s mostly generic offerings. 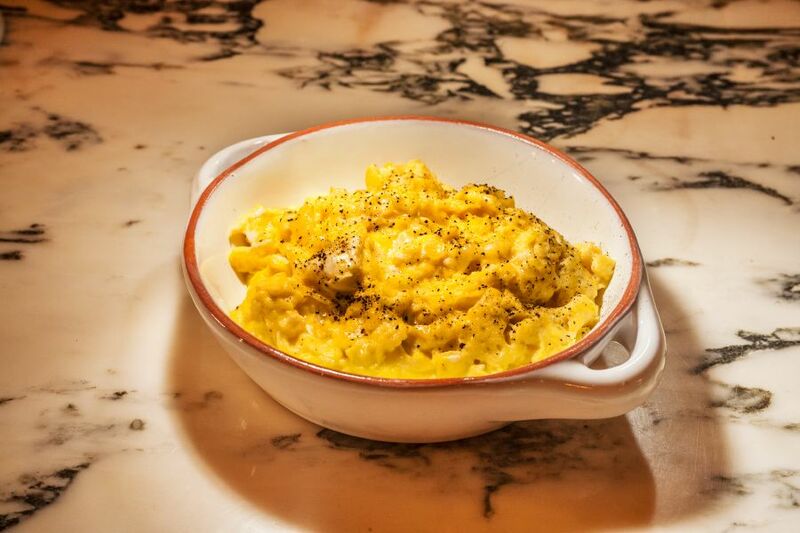 An offshoot of Bushwick Kitchen, which opened last year in the adjacent Brooklyn neighborhood, Williamsburg Kitchen’s new Euro-American fusion cuisine offers some exciting options for both brunch and dinner. 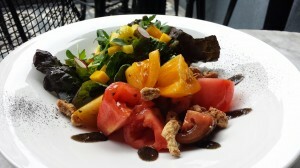 Executive chef Luis Santos, formerly of L’Artiste in Queens, seems to push the boundaries a bit more on his dinner menu, which I’ve yet to try, while offering a more simplistic, yet refined menu for the brunch crowd. It had barely been open a week when I visited, so there was still some work in progress as evident by the lack of descriptions on the Williamsburg Kitchen brunch menu and coffee not being readily available. This wasn’t too off-putting as they’re working out the few kinks of getting up and running. Luckily they executed where it counts as the food highlighted the afternoon’s brunch experience. 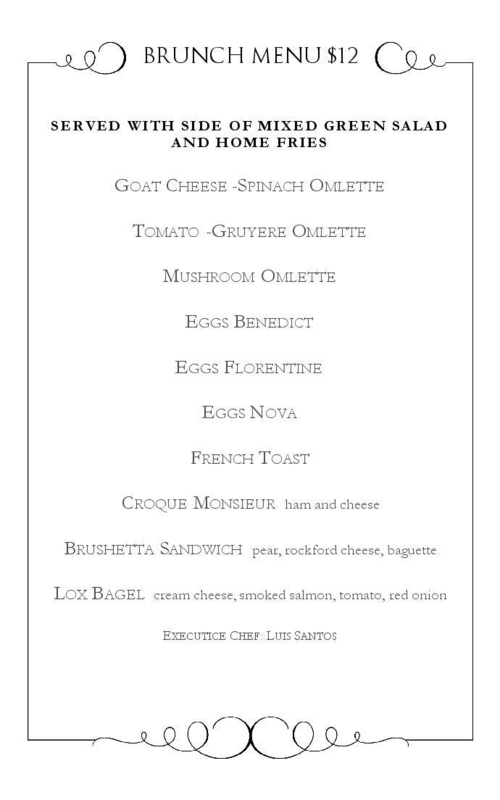 Wanting to sample the menu, my friend and I shared three different brunch entrees all of which are $12 each. 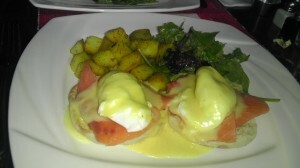 We started with Eggs Nova, a classic smoked salmon benedict served with mixed greens and home fries. The eggs were perfectly poached and the hollandaise was buttery, yet light as a nice complement to the salmon. The seemingly simple home fries were nicely sautéed and seasoned with turmeric, giving them a beautiful, bright yellow color and a delightful flavor to match. We also tried the Bruschetta “Sandwich” as it’s listed on the menu, which was a bit confusing since it’s not really a sandwich. Chopped pears and crumbles of Roquefort cheese sat atop pieces of toasted baguette and topped with a delicious truffled balsamic reduction. The sweetness of the pears combined with the saltiness of the cheese and the touch of acidity worked really well together, though I’d probably suggest this as an appetizer to share rather than a main course. The French Toast, again lacking a menu description, was a true surprise when it arrived to the table beautifully plated. Topped with orange marmalade and a drizzle of mixed berry glaze, the challah bread was browned to a nice crisp on the outside with a soft and chewy center that almost melted in my mouth. 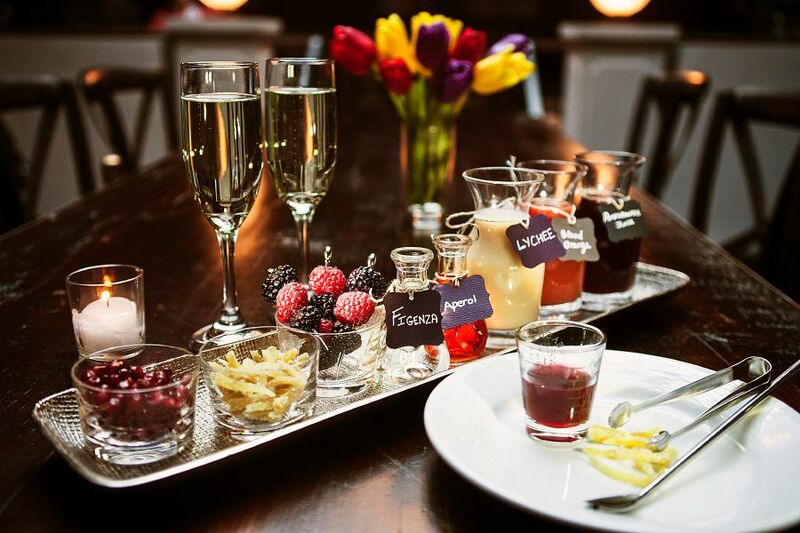 Syrup was served on the side, but it seemed unnecessary given the fruit toppings. 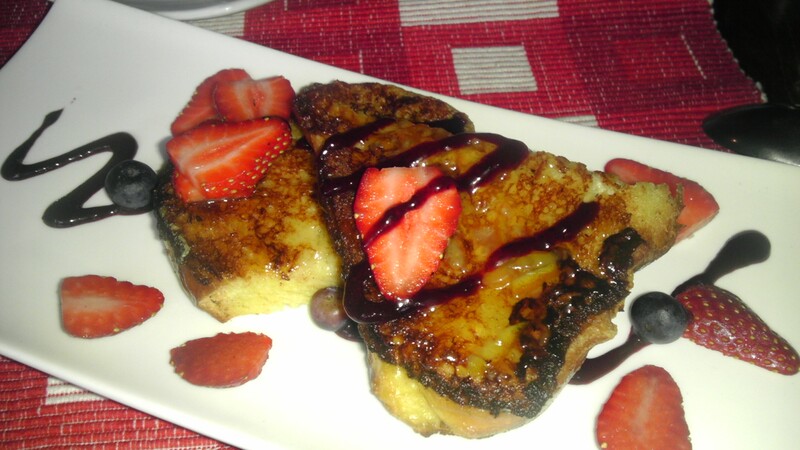 I rarely order French toast at brunch unless it’s particularly unique, but I’d consider returning to Williamsburg Kitchen for this if it’s consistently executed. Overall it is a promising start for Williamsburg Kitchen and I look forward to seeing how the menu and service evolves with the neighborhood. At the time of review, they did not serve alcoholic beverages, but were applying for their beer and wine license.